The sculpture by Michelangelo Buonarroti “Evening” also has another name “Twilight”. The height of the sculpture is 197 cm, marble. In the tombs of Giuliano and Lorenzo Michelangelo resolutely departed from the traditional type of tombstone in the 15th century with a portrait statue of the deceased, represented lying on his deathbed, surrounded by reliefs and statues that depict the Mother of God, saints and angels. The previous simple principles of combining gravestones of various statues and reliefs were replaced by Michelangelo’s deep emotional interconnection of images. The abstract idea of contrasting life and death acquires at the same time from him a poetic reality and a deep philosophical meaning. Giuliano and Lorenzo Medici are presented in deep thought; placed on their sarcophagus statues – “Morning”, “Evening”, “Day” and “Night”, symbols of the passing time – represent a kind of figurative concretization of their reflections. In the statues of both dukes, Michelangelo refused any semblance of portrait resemblance, presenting them as ideal heroes. The tomb of the Medici in this sense is the least of all a monument to two insignificant representatives of the Medici family – its significance is more widespread. A spectator entering the chapel is immediately surrounded by images full of anxiety and concern. Statues of Lorenzo and Giuliano, crushed in narrow niches, are painfully, almost convulsively curved figures of the time of day, slipping from the rounded off sarcophagus lids and nevertheless retained on them by an unknown force, pulsating plasticity of walls, dissected by a complex system of pilasters, niches and blind windows, a terrified bleached plaster of a man, The day, as if not yet formed from a block of stone, and the tragic mask – the attribute of the Night – is all under the seal of acute dissonance, not finding the way out of tension. The concentration of the will, the purposeful activity of the former heroes of Michelangelo are now lost; the physical power of the images of the Medici Chapel the more strongly they set off their spiritual fissure. Only the statue of the Madonna, one of the peaks of the plastic genius of Michelangelo, placed in the center of the wall against the altar and therefore occupies a dominant position in the chapel, is interpreted in a different way. According to dramatic expressiveness, richness and variety of complex compositional and plastic motifs, it is not inferior to other statues of the chapel, but its particular attractiveness lies in the fact that Madonna’s deep emotional excitement does not turn into a fracture, the mighty lyricism of this image is not distorted by dissonances. When creating the sculptures of the Medici chapel, Michelangelo appeared as a brilliant master of artistic synthesis. They are given here not only an architectonically justified combination of elements of architecture and sculpture – Michelangelo leads them to an emotional unity based on the active interaction of architectural forms and plastic images. With all the complexity and inconsistency of many contrasting motifs, the Medici Chapel is perceived as an artistic organism brazed by a single feeling, a single idea. 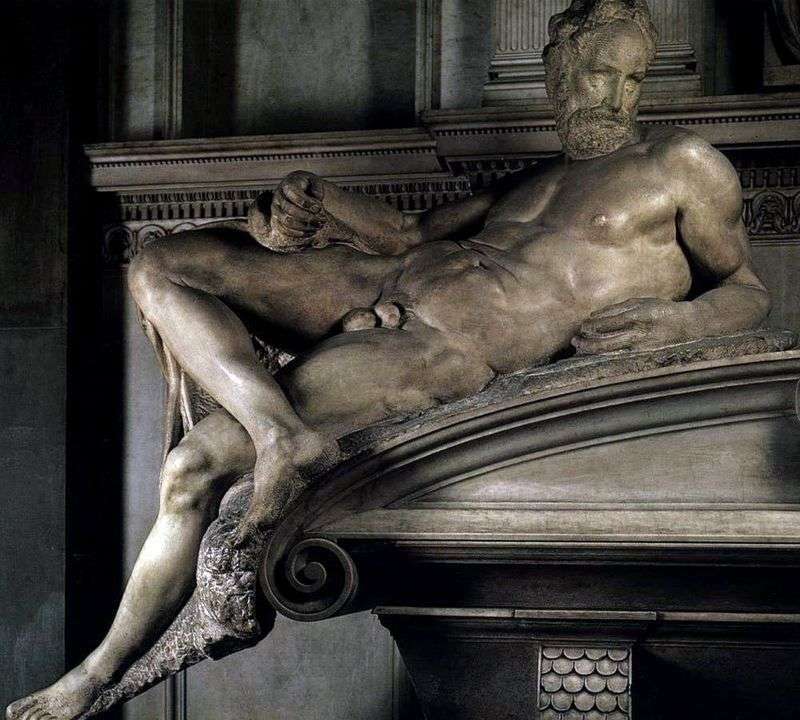 On the enthusiastic poems of the Florentine poet – Giovanni Battista Strozzi, dedicated to the statue “Night”, Michelangelo responded on behalf of the Night with a quatrain, in which he expressed his feelings: It is gratifying to sleep, to be a joyful stone. Oh, in this century, criminal and shameful, Not to live, not to feel – an enviable inheritance. Please, keep quiet, do not dare to wake me! So the author himself reveals the meaning of “Night” – an image of a broad collective meaning, behind which we see the fate of Italy, the fate of the whole era of the Italian Renaissance. Description and meaning of the painting Evening (sculpture) by Michelangelo Buonarroti.